Not all horizons of the Ledyard shale are fossilerous and of those containing collectable material even fewer underwent the proper burial sequence to permit pyritization. On a first visit, it is best to go with folks who know the section and the appropriate units to excavate. As it turns out May 10th was one such day. On that sunny and pleasant Saturday, three local clubs independently scheduled visits to the site. The Wayne County Club arrived first, many on site well before 9 AM, but Rochester and Syracuse clubs were not far behind. The total count may have reached thirty by noon time. This did create a bit of a parking issue along Route 20, but fortunately there are long stretches of Spring Creek for folks to spread out and collect. Many small fossils (or fossil pieces) are now completely encased by pyrite and are simply collectable as pyrite nodules, but the prize is to find a fully fossil still displaying its complete morphology, but completely replaced by pyrite. In addition to the ammonites and cephalopods, various brachiopods and gastropods can also be recovered fully replaced by pyrite. The replacement process requires a fairly unique series of events during preservation. As with all fossil preservation burial must be rapid to preclude scavenger dismemberment, but that is not enough. Conditions of burial must be reducing (no or very low oxygen) and must be low in overall organic matter, but with abundant iron in the formation waters. Under these conditions sulfate-reducing bacteria thrive and convert sulfate (seawater is high in sulfate) to sulfide. In the presence of iron the sulfide is immediately precipitated as an iron sulfide. The calcium carbonate in a buried shell or shell fragment provides an excellent location for the iron sulfide to nucleate and the shell is slowly replaced by either pyrite, marcasite or other unstable forms of iron sulfide. Marcasite is not stable once exposed, so we all hope that the iron sulfide we find in rocks or fossils is the more stable form, pyrite. It seems the Alden replacement sulfide is dominantly pyrite and we should not expect rapid deterioration of our finds. Nevertheless, it would be prudent to keep our specimens in a humidity controlled environment, not too high and not too low, to help preserve them. In addition to the pyritized fossils two species of trilobite are also know in the Ludlowville units at Alden. Both Phacops rana and Greenops boothi are sought be collectors at the site and these fossils can also be found outside the sulfide zone. In fact the site is known for the occurrence of enrolled or coiled trilobites. At a sign of inhospitable environmental conditions at the sediment-water interface where trilobites lived, the critters would roll themselves into as protective a position as possible and wait out the flood or other disturbance that had upset them. In some cases relief never comes and they die in this enrolled state. Finding a complete coiled or enrolled trilobite is a fossil hunter’s dream and many of both species have been recovered in Spring Creek. 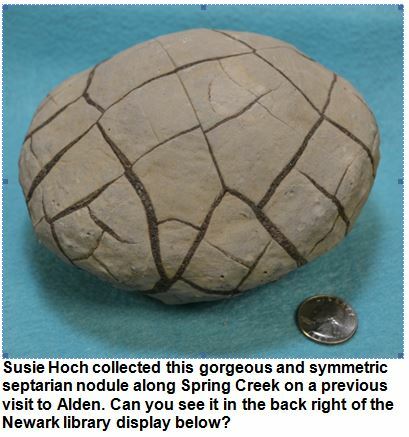 There are also concretions or nodules of various sizes that weather out of the Ludlowville shale units. These form when calcite cement starts to grow and fill the voids in the shale, usually concentrically from its nucleation point. The cemented concretion is harder than the surrounding shale. Often the concretions occur as somewhat flattened oblong spheres and occasionally they become fractured and broken after formation. The cracks can be filled by vein mineralization, usually calcite. Nodules with this form are called septarian nodules because of the often regular pattern of the mineralized fractures. Charlie, Thanks for your note. 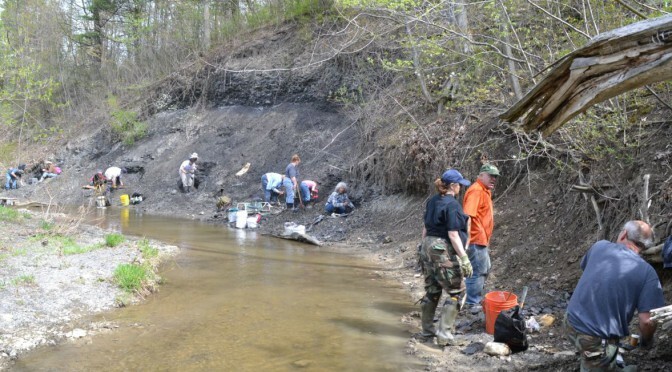 Spring Creek is a peaceful creek and I have enjoyed collecting there with others in both the Wayne County Club for which I edit the newsletter and the Rochester Academy of Science Fossil Group. 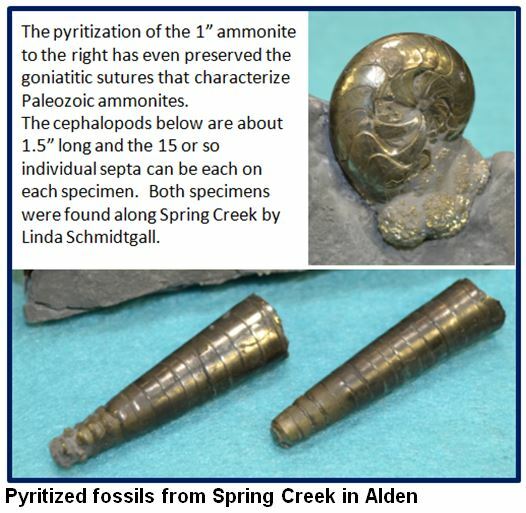 I don’t yet have much of a collection of pyritized Spring Creek fossils yet either as I have only lived in Rochester for three years. It is on my “to do list” to visit the NYSM in Albany, but so far I have not made it past Herkimer in my ventures east. I did attend the NYSGA last year in Alexander Bay and will go again this September in Plattsburgh. My background is also oil and gas; I retired in 2011 after 23 years with ExxonMobil. I am only know returning to the hardrock world. The Adirondacks draw me to them often. Cheers. I would be interested in any future trips in 2016. I would appreciate an email response. The best way to learn of our field trips is to checkout the most recent online issue of the Wayne County Newsletter and go to page 7 (or the next to last page). Website is http://www.wcgmc.org. The most recent newsletter can be accessed from the home page, others are archived on the newsletter page. The March issue will be the first one to have a listing for 2016. For our trips that require insurance coverage (i.e. quarries and some private property trips) we have to require club membership, but for many others we can, and gladly do, encourage guests.